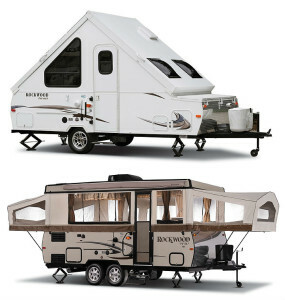 Forest River is an RV manufacturer that has pretty much all of the bases covered. They make motorhomes, fifth wheels, travel trailers and toy haulers in addition to pop up campers. And even on the pop up camper front, Forest River isn’t limited to one particular style. While Forest River’s Rockwood line traditionally consisted of very well-appointed pop up campers, it was expanded a few years ago to also include rigid-sided a-frame campers as well. In addition to their Rockwood line, Forest River also has another badge that they call Flagstaff. Both badges offer pop ups in the tent trailer, a-frame, and high wall categories. All of Forest River’s Rockwood and Flagstaff pop ups tend more toward the heavier side of the spectrum. The lightest model (their shortest a-frame) has a hitch weight of about 260lbs, and the heaviest (a 28 foot tent trailer) has a hitch weight of just over 400lbs. High Wall 23'9" - 28'4" 279 - 404 lbs. 2,773 - 3,676 lbs. 3,779 - 6,250 lbs. Classic 17'1" - 19'1" 258 - 358 lbs. 1,986 - 2,473 lbs. 3,212 - 3,358 lbs. Mac Series 12'0" - 26'0" 174 - 350 lbs. 1,344 - 2,975 lbs. 2,148 - 5,579 lbs. Hard Side (a-frame) 17'1" - 22'1" 261 - 354 lbs. 1,888 - 2,186 lbs. 3,152 - 3,854 lbs. High Wall 19'1" - 28'4" 315 - 404 lbs. 2,773 - 3,676 lbs. 3,779 - 6,250 lbs. Hard Side (a-frames) 17'1" - 22'1" 261 - 354 lbs. 1,888 - 2,186 lbs. 3,261 - 3,854 lbs. Premier 17'1" - 19'1" 258 - 358 lbs. 1986 - 2,473 lbs. 3,212 - 3,358 lbs. Freedom 12'0" - 26'0" 174 - 350 lbs. 1,344 - 2,975 lbs. 2,148 - 5,579 lbs. For service, contact your local dealer.